The pantry project has been set in motion and brought to an abrupt halt all in one day. Imagine. Let's chalk it up to typical Friday circumstance. We have decided to try a stencil on the walls to add colour to the space. Robert is skeptical about the idea and argued for wallpaper instead. So let it be known that if the stencil is a flop I am fully to blame. Don't get the wrong idea with this because I am a fan of wallpaper but admittedly am too cheap to put it in the pantry. *I'll have to contrive a plan of approach so that Robert thinks wall paper was his idea when it comes time to do a bathroom. We are hoping the stencil will be a perfect solution and are excited to give it a try; well I am at least. The stencil is from a company out of the US called Cutting Edge Stencils. Which brings us to the hiccup in the timeline because it will arrive only in an indeterminate number of days. On the positive side, this will give us more time to prepare and organize the pantry contents, so not all is lost. 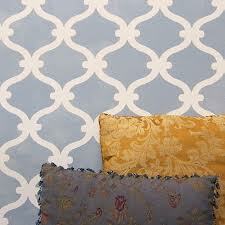 I'm very excited about our choice of geometric pattern. We went with a Tuscan Trellis Allover stencil. The walls in the pantry are currently white, so that will be the base colour for the pattern in order to be budget conscious. And as far as the second colour, for no particular reason, I am leaning towards a pale eggshell blue. There are pops of blue throughout my house, but up until now shades of green have dominated the wall space. What colour screams 'Come in! Fancy a potato, can of soup? Maybe a serving tray?' You know? Any thoughts on this? Suggestions would be greatly welcome. I can't wait to see how it looks all stencilled!